Habitat: They grow in the shade of bushes and occasionally in open areas. 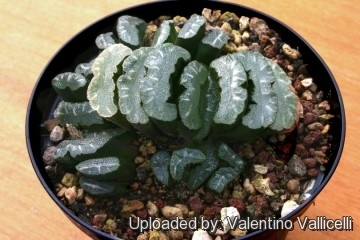 They grow underground with only the apex of the leaves rising above the soil surface so that they are difficult to find. This is an excellent protection against herbivores . 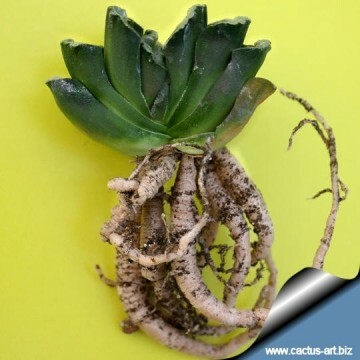 This very singular plant has contractile roots that will pull the plant into the ground during times of drought, leaving only the windowed tops exposed. 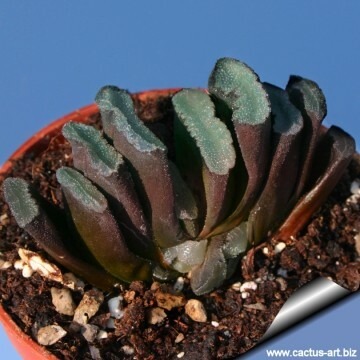 Description: This desirable species, despite the fact that actually is common in cultivation, still inspires trepidation and admiration by way of its unusual truncate leaf tips. 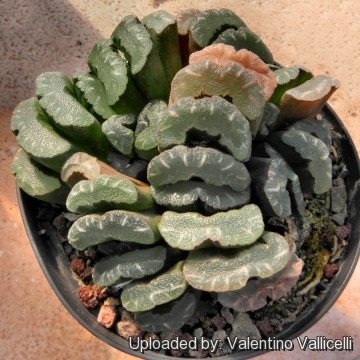 It is a superb plant, unique, distinctive and very different for any collection. Leaves: The leaves look as if they have been roughly cut off at the tops and they are arranged like a fan, not a rosette. As the plant grows take on an almost crested appearance. 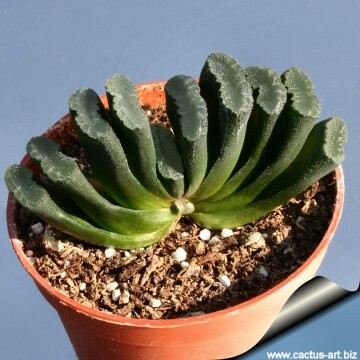 The leaf size and thickness, of the end-areas will vary greatly from clone to clone. 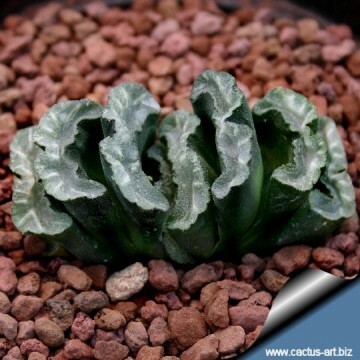 The surface is warty and the blunt end is transparent whit some interesting leaf markings, others are rather plain, this "lightning flash" patterns in the leaves do not come out until the plant reaches maturity. Fenestrate leaves: This plant is a choice example of the window-leaf ( fenestrate leaf) adaptation found in many Haworthias, Mesembreanthemums and Peperomias, the translucent 'glassy' windowed apices allow light into the internal plant body rich in chlorophyll-bearing layers of cells, thereby providing a much larger assimilation area. The windows greatly increase the photosynthesizing area by allowing light into the centres of leaves and at the same time avoiding water loss. 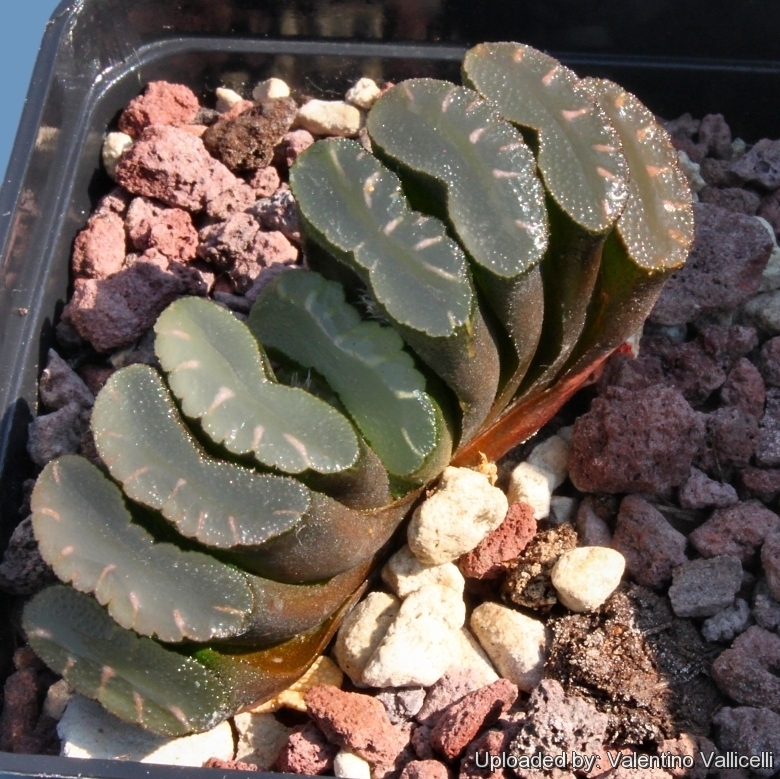 Remarks: This species has been the subject of passionate work of breeding and selection by the Japanese, and a number of wonderful cultivars with white lacy patterns on green-grey windowed tips have been developed and propagated, and some specimens have a very unique leaf shape. Notes: Contractile roots pull this plant deeper into the soil to protect it from sun and heat during the dry season. Contractile roots are found in many plants species mainly at the base of an underground organ (bulb, corm, succulent rosette, etc.) The contractile roots continually pull the plants deeper into the ground as the stem elongates so the it remain subterranean or at an appropriate level in the ground.. Contractile roots are usually broad, fleshy, vertical, tapering, wrinkled looking and very distinct of the rather cylindrical fine absorbent roots and are capable of incredible effort. Fertilization: Feed it once or twice during the growing season with a fertilizer specifically formulated for cactus and succulents (poor in nitrogen), including all micro nutrients and trace elements diluted to ½ the strength recommended on the label. Frost Tolerance: Light frost protection required. 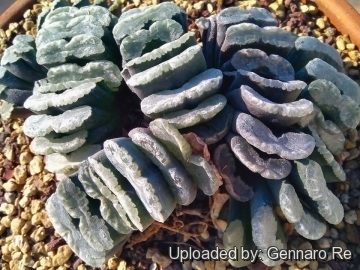 It requires a minimum temperature of about 5°C (But will take a light frost and is hardy down to -5(-7)° C for short periods if it is in dry soil). USDA zones 9A – 11. 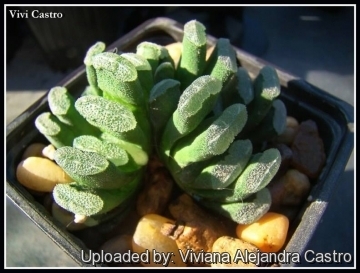 In areas prone to frost, grow in an intermediate greenhouse or conservatory, in pots.